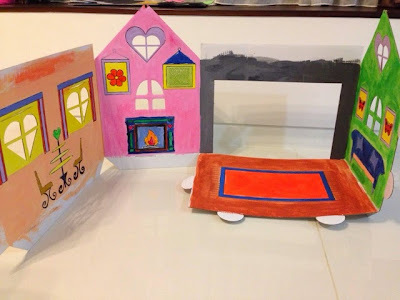 I am always on the look out for fun projects or activities to do together with the children. These are deposits made into their memory bank and I like to think that when they grow up and look back into their childhood, they will remember all these precious time we spend together. As it's the local school holidays, many malls are running promotions with kids related activities. Parkway Parade is giving away a carton doll house or a train station with every $80 purchase and as I happened to be in the mall and did some shopping, I was able to redeem a set of the former. The kids were excited when they came home and saw the unpainted carton doll house. I explained to them that we had to paint the house together first before we could play with it. The kids thought it would be fantastic to use it together with their Sylvanian Families toys when it is completed. The moment they finished their afternoon tea/snack, we started to get to work! 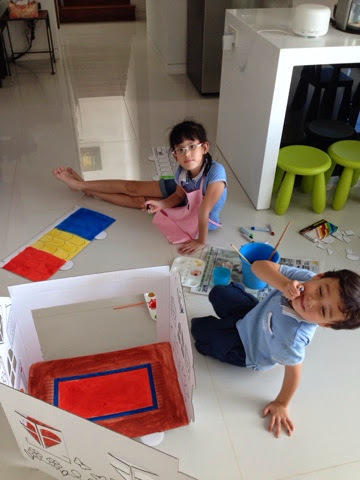 The girl took responsibility of painting the roofs and the boy wanted to work on the floor and the carpet. I helped with the walls and some of the exterior. We were hard at work for almost two hours but only managed to finish 40% of the painting. We had to stop as it was getting close to dinner time and the kids needed their showers. We took a day off as I had plans for the kids to attend a rainbow loom workshop (which will be reviewed in another post) the next day. 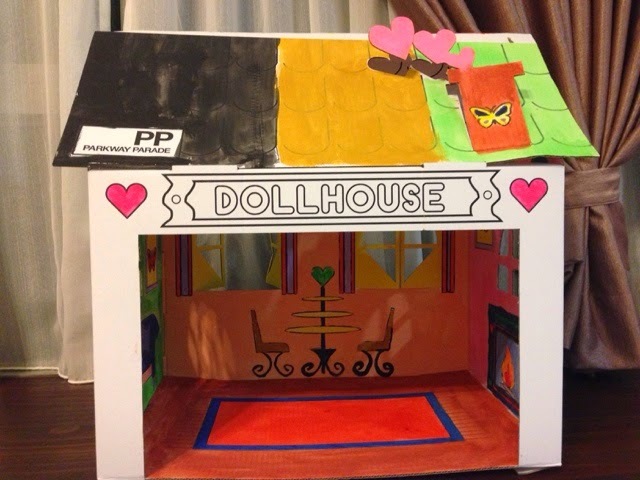 We went back into project dollhouse the day after and managed to paint all of the interior! Here's the final look of the inside of the house. With the help of the husband, I assembled the house after the kids went to bed and now it's almost completed. We just have to add some colours to the exterior and I'm sure the Sylvanian Families will be ready to move in! The kids were delighted when they woke up in the morning and found the house the way it was. We did not paint the exterior as we went to watch "How to Train a Dragon 2" today but I'm sure we will just need one more day! Tomorrow I hope I'll be able to post an updated picture of the fully completed doll house. My take on TV/Smartphone/Tablet and children. A video of the future Thierry Henry?